SpaceX can celebrate another successful mission, launching their Falcon 9 rocket on Sunday for its second west-coast mission – successfully placing into orbit the Jason-3 oceanography satellite in a U.S.-European collaboration. A minor grain of salt was another loss in the battle over technical bugs in the company’s booster return to the Autonomous Spaceport Drone Ship in the Pacific Ocean that saw the rocket make a hard landing on only three of its four legs. The 68-meter tall Falcon 9 rocket – for the last time flying in the v1.1 configuration – leapt off its launch pad at Vandenberg Air Force Base on California’s central coast at 18:42:18 UTC under the loud thunder of its Merlin 1D engines, lifting the rocket with a total thrust of over 600 metric-ton-force. 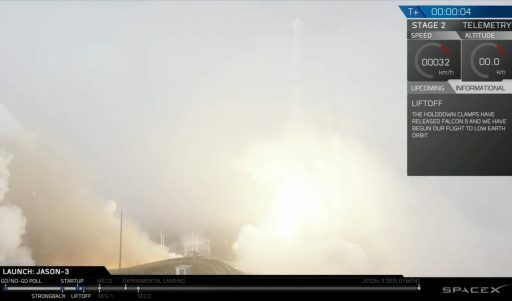 Liftoff was barely visible in a thick layer of fog that enshrouded the Falcon 9 since the early portion of a dynamic countdown that required the joint NASA and SpaceX team to overcome several technical challenges. 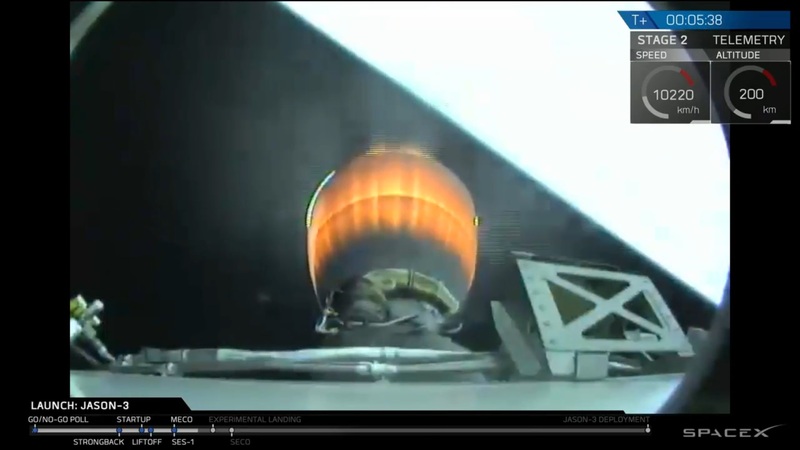 The first stage burned for just over two and a half minutes, handing off to the second stage for an initial six-and-a-half-minute burn to enter an elliptical orbit for a 45-minute coast, one of the longest ballistic phases of any Falcon 9 primary mission to date. Separating from the upper stage 67 Kilometers in altitude traveling five times the speed of sound, the first stage embarked on its landing adventure, first flipping around and ignited a trio of Merlin engines for a partial boost back to home in on the Autonomous Spaceport Drone Ship, deployed to a position 300 Kilometers due south of the hillside SLC-4E launch pad. A re-entry burn of 25 seconds followed when the booster passed 70 Kilometers in altitude and the four aerodynamic grid fins set the ~42-meter long first stage on its course towards the deck of the evacuated drone ship. Firing up its center engine, Falcon 9 deployed its landing legs and attempted a gentle descent to the ‘Just Read The Instructions’ Drone Ship that did not end as planned when one of the four legs failed to latch in position and collapse upon contact with the deck. 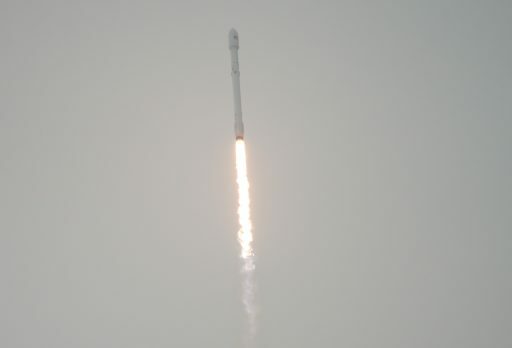 SpaceX can not yet mark a win over technical challenges that also created a pair of close calls on the first attempts of returning the booster to the downrange platform in the Atlantic Ocean last year. On the positive side, the landing attempt – despite not ending with a booster sitting atop the ASDS – showed that Falcon 9 and the Drone Ship can meet up even in adverse sea conditions as the first stage made a gentle touchdown just 1.3 meters from the center of the deck. Sea swells were on the order of four meters at the time of landing with a wave frequency under 20 seconds, creating rather challenging conditions. 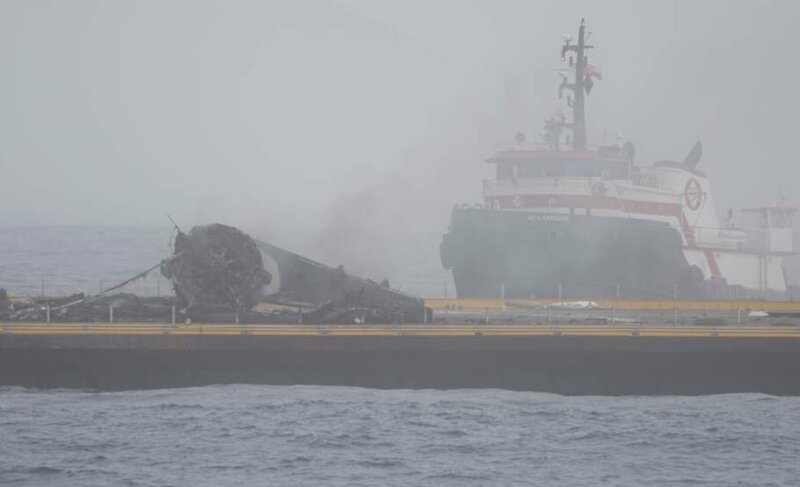 SpaceX was also able to recover a portion of the stage which remained on the barge, but burst into flames after the botched touchdown. Whether the recovered components are of any use for post-flight assessments will become clear once the ASDS returns to port. While the first stage made its landing attempt in the Pacific Ocean, the second stage’s MVac fired for a little over six minutes and successfully achieved a parking orbit of 175 by 1,321 Kilometers, entering a 45-minute coast phase to climb all the way up to the apogee of the orbit for the second burn to act as circularization maneuver. The short 5.5-second firing of the 801-Kilonewton MVac engine successfully placed the stack into the desired orbit with orbital parameters reported at 1,305 by 1,320 Kilometers at an inclination of 66 degrees. Jason-3 was sent on its way 56 minutes after launch, embarking on a mission to continue a record of ocean topography data to gain a better understanding of global circulation patterns, sea level changes and their climate implications as well as operational applications in weather forecasting. The Jason-3 satellite, operated by NOAA, Europe’s weather agency Eumetsat and the French Space Agency CNES, weighs in at over 500 Kilograms and is outfitted with the Poseidon 3B altimeter as its primary instrument, capable of recording ocean topography with an accuracy of a few centimeters to detect currents and near-ocean-surface winds. Also onboard the satellite is the Advanced Microwave Radiometer 2 that delivers data needed for the correction of altimetry data from Poseidon, accounting for water vapor in the atmosphere. Furthermore, Jason-3 is outfitted with precise orbit-measuring systems for data calibration and a Joint Radiation Experiment tasked with measuring the influx of charged particles vs. energy as well as the effect of space radiation on modern electronics in an orbit higher than what is the norm for Earth observation missions. Jason-3, the fourth satellite of its type, continues a two-decade record of ocean altimetry measurements – of vital importance when following the global circulation patterns, sea level changes and climate implications in a constantly warming world. Long-term and continual data of changes in the oceans is essential for both, operational applications and scientific research. Operational use of ocean altimetry data can in the forecasting of hurricanes and severe weather, tracking weather patterns as they traverse the oceans, forecasting surface waves for offshore operators, tide forecasting and tracking of currents to aide commercial shipping and shipping routes, and forecasting of weather phenomena such as El Niño and La Niña. The scientific benefits of a long-term measurement of ocean topography provides insights into climate change processes. After separation from the rocket, Jason-3 successfully stabilized its three-axis orientation, checked in with ground stations and began the deployment of its two power-generating solar arrays with the firing of pyrotechnic launch locks. The full deployment of the arrays was confirmed after some delay because the satellite had traveled out of ground station range before full deployment could be confirmed. 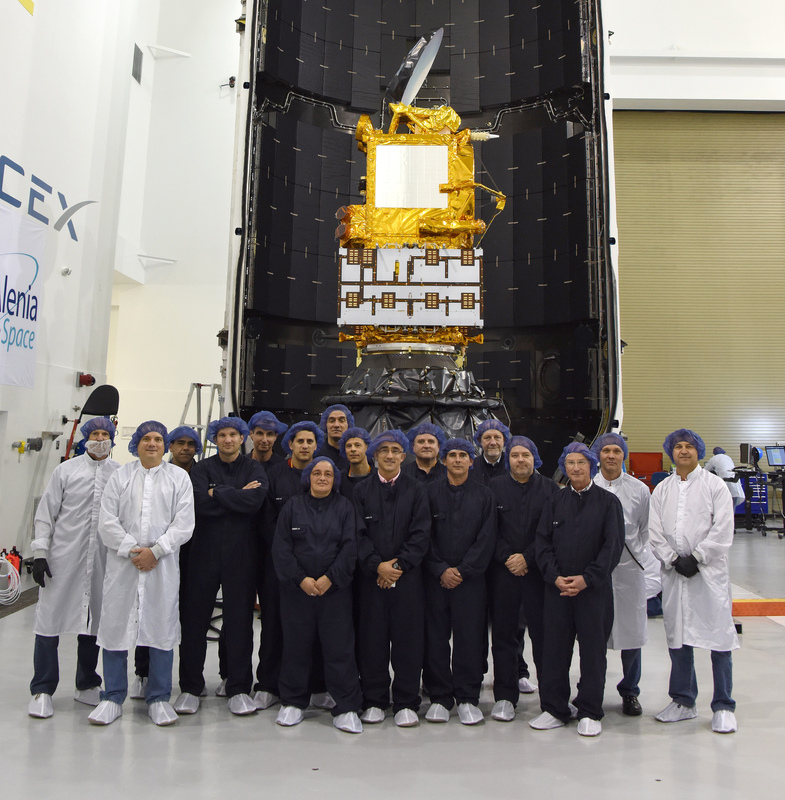 Mission Teams announced later on Sunday that the arrays were fully opened and power was being passed to the satellite’s battery. Initial health checks showed the satellite in a good configuration after its ride into orbit and teams will be busy for a period of days to check the satellite core systems before heading into the activation of the instruments. 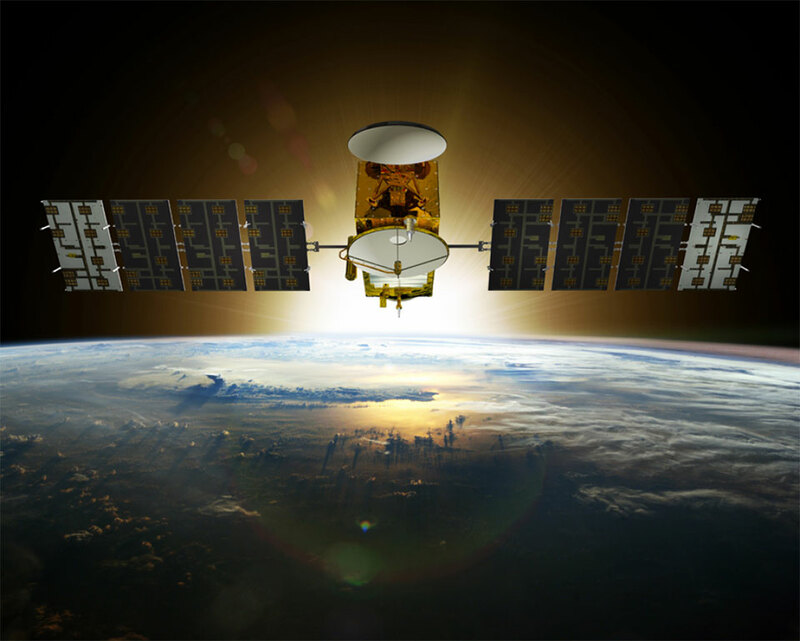 It will take several weeks for Jason-3 to finish instrument commissioning and the adjustment of its orbit to enter a formation with Jason-2. Orbital data released by the Joint Space Operations Center showed the Jason-3 satellite in an orbit of 1,295 by 1,320 Kilometers right at the desired inclination of 66.05°. 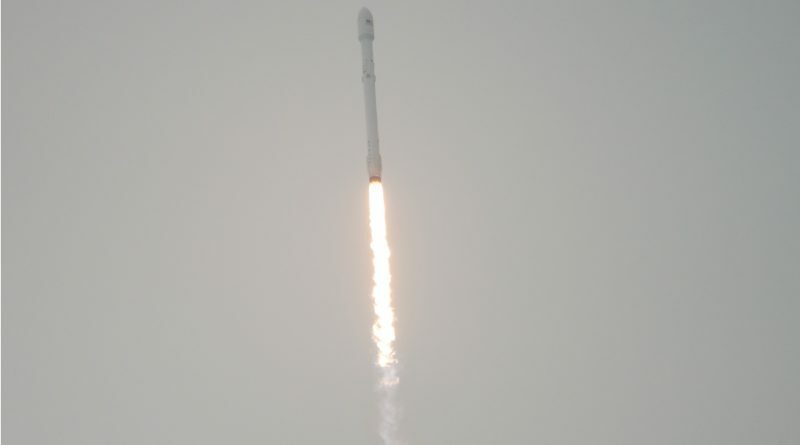 A trajectory assessment by the satellite team showed Jason-3 to be just one Kilometer from its target orbit, marking a very precise orbital insertion performed by Falcon 9. 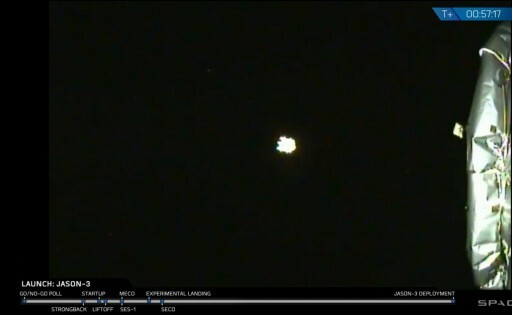 The second stage of Falcon 9 executed a deorbit burn of around 20 seconds one hour and 20 minutes into the flight, demonstrating that it can re-start more than once which may be needed for future missions taking satellites directly to Geostationary Orbit. The burn set the stage up for a destructive re-entry over the Pacific Ocean between Hawaii & Alaska’s Aleutian Islands. Only the Jason-3 satellite was cataloged, confirming that the second stage was successfully withdrawn from orbit. For SpaceX, the next launch is coming up in early February with the SES-9 mission, to become the first Geostationary Transfer flight of the Falcon 9 Full Thrust variant. The company will resume Dragon cargo flights to the International Space Station in early March which will also present the next opportunity of returning the first stage booster for a landing on shore. Vandenberg will again get a break in Falcon 9 launches, though SpaceX expects to be back for several missions towards the end of the year.